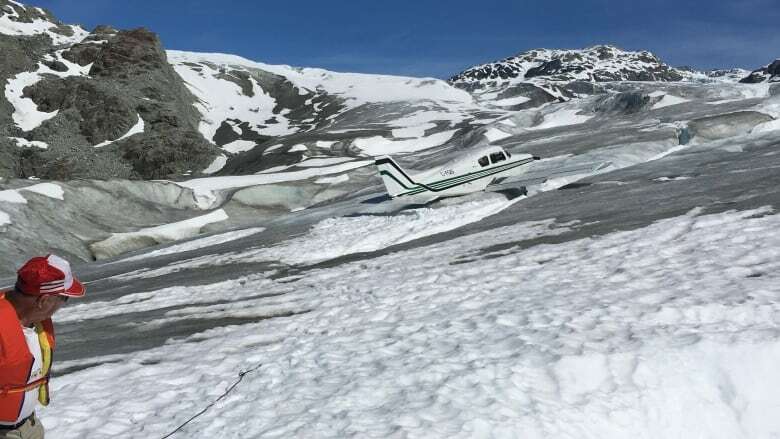 An 81-year-old pilot who made an emergency landing on a glacier north of Whistler, B.C., is being hailed as a hero by his passengers. 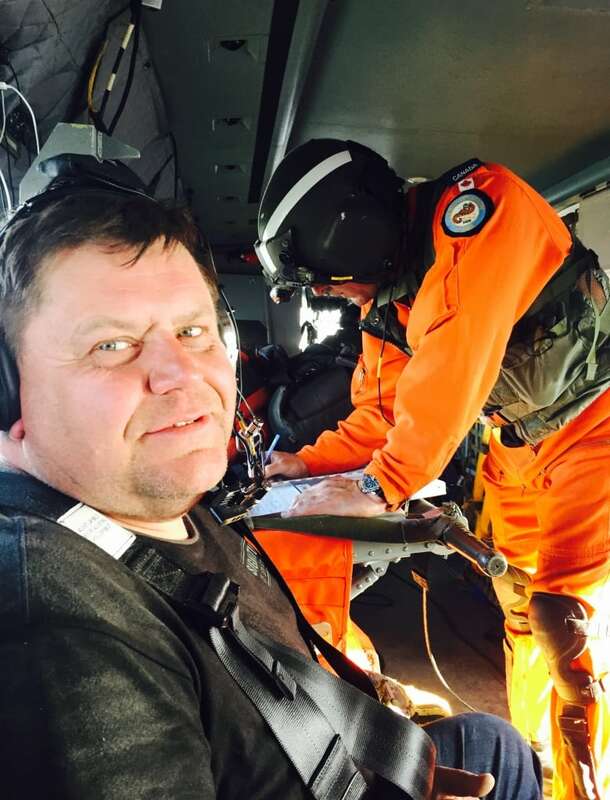 Pilot Vern Hannah was on a day trip from Pitt Meadows to Whistler on Sunday morning with two passengers in his single-engine plane when he took a wrong turn down a mountain valley. "The map showed turning to right into Whistler, but we turned into a valley before we got to Whistler, and that was the mistake," Hannah told CBC News on Tuesday morning. The valley was too narrow to turn the plane around, so they started to look for another way out. "It was too late to turn back, so all we could do was try and out climb the valley, so we flew up the valley," said Hannah. "But we kept losing airspeed and there was a terrific downdraft that kept us from climbing.… Pretty soon we were right close to the rocks." His passenger Zbigniew (Peter) Jedynakiewicz, 54, was in the seat next to him learning how to fly the 1963 Beechcraft Musketeer. "We tried to accelerate — that was the end of the valley, like cul de sac. I say, 'Full power! Full power!' But the plane doesn't respond," said Jedynakiewicz. Hannah was able to keep the plane climbing, but with every passing moment, they came closer and closer to stalling and crashing. "We had no time. It was an absolute emergency. It was a matter of doing what we had to do immediately," said Hannah. Miraculously, they crested some rocks and spotted the glacier of the Pemberton Icefield just ahead, where Hannah put the plane down on the soft snow. "We could have really crashed into the rock and there was lots of fuel in the wing. 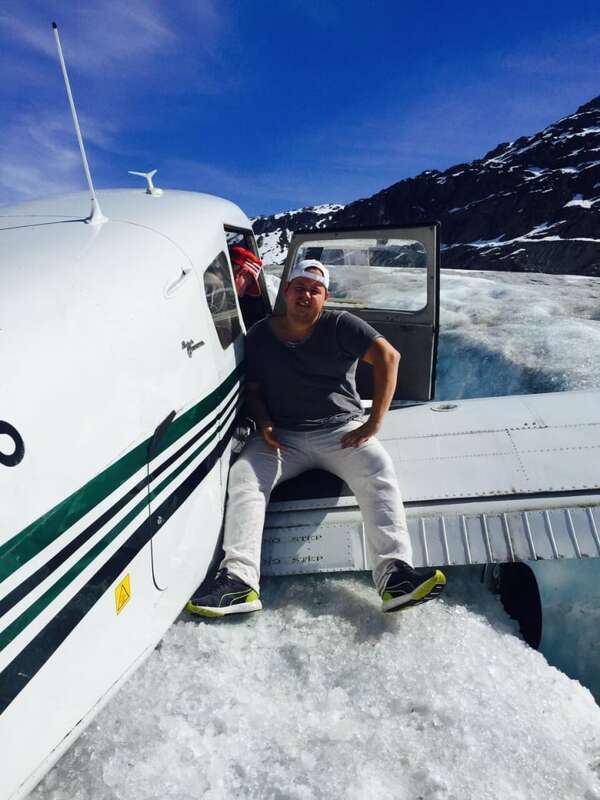 But he got [the plane] over the glacier ... and basically with the wheels under wings [we land] like icing on the cake, so nice, so smooth. And just stop immediately." "I checked in the last second, the speed it was 40 miles [per hour] when [we made] impact with the ice," marvelled Jedynakiewicz. "It was a soft landing, soft like on a pillow. Believe me." "It was a soft landing. A little bit of bump," Hannah confirmed. "First thing was say, 'Oh, God thank you we are alive.' Not even scratch can you imagine? Three of us,'" said Jedynakiewicz. Also in the plane was a visitor from Poland, Alan Widelski, 27, who has only been in Canada for a month. 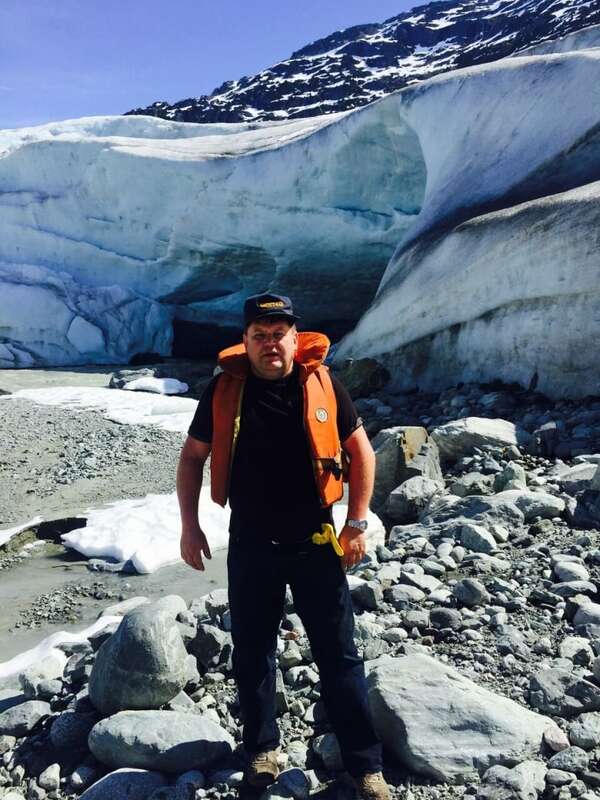 Jedynakiewicz said the men crawled across the glacier on their hands and knees to avoid falling into crevasses. Once in the trees they decided to try to follow a river, a tactic Jedynakiewicz said he had seen on a National Geographic program about a plane crash in Argentina. But the hike was much tougher than they anticipated, and they ended up spending a night in the forest. The next day the Polish visitor, who works as a lifeguard, decided he would try to ride a fallen tree down the river to hopefully find help more quickly. But that's when a rescue helicopter started appearing overhead, eventually spotting the men in a tiny clearing at the side of the river. "The rescuer saw us on this beach, maybe 150 feet by 80 feet," said Jedynakiewicz. "If I'm between the tree no one would notice us. And we wave for maybe one hour and finally they saw us." The search had been launched on Sunday night when the plane failed to return home. A Buffalo plane and Cormorant helicopter from nearby CFB Comox had spent the night looking for them. 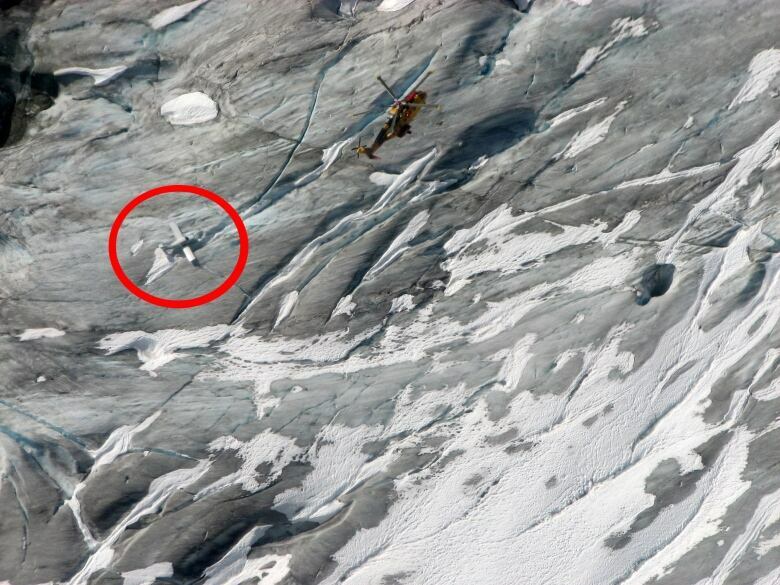 On Monday morning they were spotted by searchers, after a snowmobiler on the glacier reported seeing what he thought was an old wreck in the distance, but was actually their unoccupied plane. Both men said they are likely done flying for now. "I think no more after this," said Jedynakiewicz. "I have family. I love them too." "Probably yes. I don't need to fly anymore," said Hannah. "He is my hero," said Jedynakiewicz. Transportation Safety Board investigator Bill Yearwood told CBC News the single-engine plane was underpowered for the conditions and weight of the plane, circumstances that would normally end in disaster, especially when attempting to fly over mountains. "It's fortunate the pilot didn't try to turn at low level and low speed, which we've seen in many cases, causing the aircraft to spin in to the ground and hit at a very acute angle, which makes it often unsurvivable," said Yearwood. "In this case the collision was at slow speed and a glancing angle and everybody is OK. So it's a good news story." According to Yearwood the pilot hadn't filed a formal flight plan. "Leaving a good itinerary — just like hikers on the North Shore — pilots need to do that. And having a functioning emergency locater transmitter would have allowed for a quick rescue, probably 24 hours before it actually occurred. So it could have been better," said Yearwood. The TSB will not be carrying out a formal investigation because they have been able to determine the reasons for the crash, Yearwood said. The men said the plane had an emergency beacon, but it failed to go off, perhaps because of the soft landing.